Owners of more than 300 properties across San Francisco have missed the final deadline to start an earthquake-retrofit project required under the city’s Soft Story Mandatory Retrofit program. Fifty of those buildings are in the Mission. 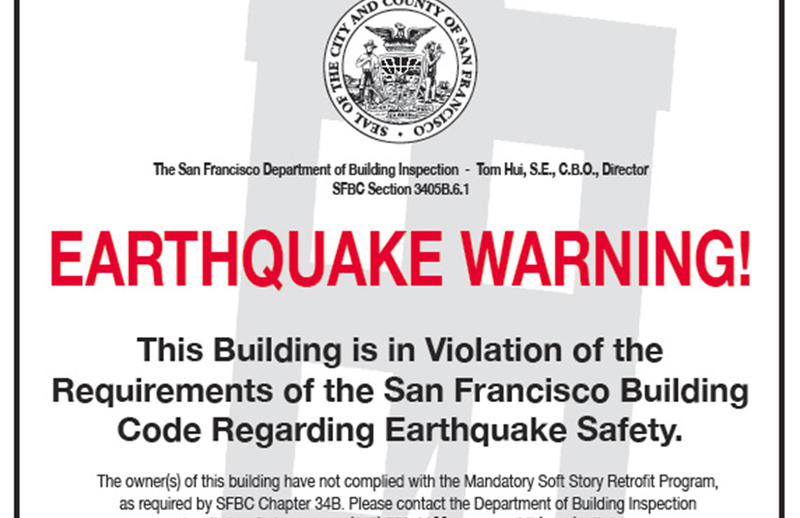 Buildings that are not in compliance have been plastered with warning signs reminding owners and alerting tenants and visitors that the structure is in violation of the ordinance and at risk of collapse in an earthquake. The buildings not in compliance represent just 7 percent of the structures citywide that the program identified as requiring retrofits. But, given the danger that these buildings present to occupants in an earthquake, program officials are pushing to get every last building upgraded. “An earthquake can come anytime. It could happen tonight,” said Tom Hui, director of the San Francisco Department of Building Inspections. “Ninety-three percent is very good,” but full compliance is necessary to protect the public. The 93 percent of buildings that have so far complied have met deadlines to file permits or complete work. Deadlines were staggered across four tiers of properties, beginning in 2015. More than half are currently finished with construction. (Here in the Mission, 92 percent of identified problematic buildings met the deadline to comply). Sept. 15, 2018, was the deadline for owners of the fourth and final tier of properties to pull permits for their retrofitting projects. Tier 4 properties — which include multi-story structures with five or more dwellings and a ground-floor commercial space — have until September 2020 to complete the retrofit. In the Mission, 225 properties meet Tier 4 criteria; all but 29 met the Sept. 15 deadline. Just under 600 Mission District buildings across all tiers were identified as needing retrofits. These buildings are all listed on the soft story program website, where anyone can check on the compliance status of any building that requires retrofit. Since the September deadline passed, the Department of Building Inspections has begun a code enforcement process to encourage remaining Tier 4 property owners to comply. Hui said that in addition to the signs posted on non-complying buildings, warning letters have been sent to owners. His department is also scheduling hearings with those owners. Any who do not submit a timeline for complying with the program will receive an order of abatement, which officially records that code violations remain on a property. This adds costs and prevents an owner from doing other work or selling their property before correcting the recorded violations. When the soft story retrofit program launched in 2013, nearly 5,000 properties across the city were identified as needing the work, which is meant to shore up buildings especially susceptible to damage in an earthquake. The targeted buildings — all multi-story wood-frame structures with five or more dwellings, permitted for construction before 1978 — are especially vulnerable because of their “soft story” lower level. Soft story structures feature lower levels with large windows or other openings on the outside of the building and large open spaces inside, such as garages, retail spaces, and more. With fewer partition walls, the lower level is weaker and more flexible than the upper stories, and cannot support the movement of its more rigid upper levels in an earthquake. A city-ordered seismic analysis estimates that a quarter of these buildings would collapse in a strong earthquake. Modern building codes adopted in 1978 include architectural safeguards against this kind of vulnerability.